There are days when I just want to clear my head, and bluegrass is just the ticket whenever one of those days comes along. 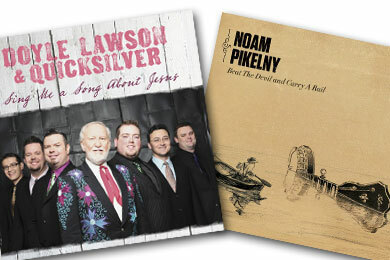 This stack of current bluegrass CDs includes offerings from three of the genre’s most enduring and brilliant groups — Special Consensus, the Lonesome River Band and Doyle Lawson & Quicksilver. The last named won my heart as the Disc of the Day. I caught Quicksilver’s set during Fan Fair was blown away (again) by just how stunning the band is in performance. The Punch Brothers play what they call “Plunk Rock,” which is to say acoustic music with an attitude. Fresh from performing at Bonnaroo comes the group’s Noam Pikelny with a dandy new CD. This is his first appearance in this column, so that makes him a DisCovery Award winner. —The second album by Punch Brothers banjo man Pikelny is packed with stellar support — Jerry Douglas, Tim O’Brien, Stuart Duncan, Steve Martin, Chris Thile, Bryan Sutton…you get the idea. If you go to his website, you can get this track from it as a free download. It’s an ear-tickling, four-minute instrumental romp with a heartbeat bass line, courtesy of the always-great Mark Schatz. The CD’s title is Beat the Devil and Carry a Rail. Heartily recommended. —The band isn’t particularly flashy, but this hillbilly tenor soars with sincerity on the CD’s title tune. He didn’t write it, but the lyrics are all about the birth of a daughter, which is exactly what happened to him in real life. —This sounds like a classic country track from the ‘60s, right down to the “answering” fiddle, steel and electric guitar. I’m in. The rest of her The Distance CD is straight-ahead bluegrass, by the way. —Co-writers Hensley, Rogers and Lawson are also the awesome harmony vocalists on this toe tapping title tune of the newest Quicksilver CD. Nobody, but nobody, does bluegrass gospel better than this breath-taking ensemble. I remain an enormous fan. —Osborne’s piercing, incredible tenor can still cut the mustard. At age 80, he sings with the vigor of someone literally half that age. His group’s new collection is titled New Bluegrass & Old Favorites. —Nominated as Duo/Group of the Year by the Americana Music Association, this African American string band continues is superior music-making ways on its new Leaving Eden collection. On this rhythmic track, the North Carolinians tell the tale of a musician who’s seen the world but still loves family and home the most. The 15-song collection is available on vinyl, by the way. —The Lonesome River Band is celebrating its 30th anniversary with a collection titled Chronology: Volume One. It includes this lively, zippy, tightly arranged update of Eric Anderson’s folk classic, which is currently rising fast on the Bluegrass Unlimited popularity chart. Deservedly so: It’s a listening delight. —The Boxcars play like the seasoned and accomplished vets its members are, so the instrumental work is flawless and dazzling. However, the group lacks charisma in the vocal department. —Bluegrass music is always looking backwards, but never more so than in this 100th anniversary of Bill Monroe’s birth. It seems like there’s a tribute album of one sort or another in the mail every month. Blaylock’s takes the approach of avoiding many of the obvious songs in favor of some of the master’s lesser known tunes. This lickety split take on a 1947 classic plays like greased lightning. Guests on the CD include Del McCoury, Carl Jackson, Ronnie McCoury, Lou Reid and Bobby Osborne.